Scrolling through the credits list on director Kevin Kerslake’s website, you would be hard pushed to find a genre of music that this filmmaker hasn’t invested his time and work into. For everyone from Flying Lotus to Pearl Jam, Groove Armada to Sonic Youth, Kerslake has been behind the camera on music videos, live performances, and feature length projects for decades, showcasing his adept flair for capturing a relentlessly energetic music industry. It’s a style perhaps most clearly recognised in Kurt Cobain swinging wildly from a chandelier in the music video for Nirvana’s ‘Come As You Are’, one of several Nirvana videos Kerslake directed. His camera is never still, slurring images of performance and roaming through the sweat and haze of rock stardom to build a broader sensory experience around a piece of music. As The Offspring race wheelchairs in ‘The Meaning of Life’ or colours flash past a spinning R.E.M. in ‘The Sidewinder Sleeps Tonite’, songs evolve into strikingly visual storytelling in Kerslake’s hands. Focusing on individual frames of the blur and speed in these videos can leave you dazed, projections of a musical world in keeping with its own wonderful delirium. 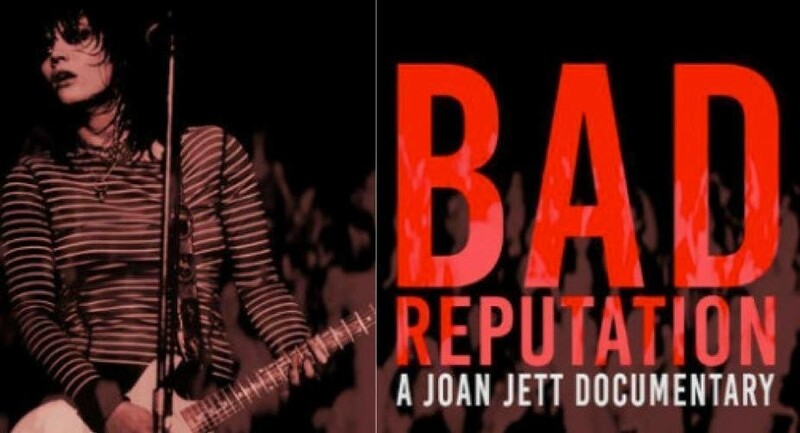 Bad Reputation weaves together the narrative of Jett’s life across these three simple aims, the championing of a woman who has done so much for the rock ‘n roll she so famously loves. Discussing the origins of the project and its creation, Kerslake saw a timely opportunity in profound circumstances, at once surprised a documentary feature on Jett was not already in existence and grateful for the opportunity to deliver her story. Now more than ever, the time was right. The film pays close attention not only to the extent of Jett’s personal career but the ways in which she was able to extend herself beyond her own successes, as an engaged and supportive peer and colleague for those fighting their way through the industry. The film brings together industry colleagues, musicians, and friends to build a portrait of Jett’s life alongside her own stories and recollections. As well as filming musicians and performances Kerslake has a history in the surf and skate worlds, finding a common denominator across this range of interests in the strong sense of kinetic energy that underscores each of them. Our conversation turned to Kerslake’s other projects, both past and future. Capturing the annual dance music festival, Electric Daisy Carnival, was like “going to war” he jokes. He describes his task as being “in charge of harvesting what those experiences are like from every single perspective”, delegating “pie slices” of the event to his experienced team of camera operators to capture a wildly intense 360 environment. It’s total “composure within that chaos” that is needed to achieve these aims, and this is where Kerslake thrives, in the energy of these environments and in the ability to present a rounded portrait of such mania to those watching. He lets the power of his subjects’ experiences flow freely and distinctly, translating their dynamism and spirit on screen. Bad Reputation is out now.